When it comes to starting up a business, sometimes legalities can be a daunting task. I can't give you a step by step, however, I can give you resources and a little knowledge. For us in the United States, we're at the end of tax time. I'll be honest, I did my taxes last night. Yes, they are due on Thursday. I'm a procrastinator. The reason being, for 2009 I was not very organized. So it took me several hours of calculating receipts and gathering information that should have been in my spreadsheet. I'm taking my own advice from last week's post, though, and I've set up a spreadsheet for 2010. This way, I can sit down once a month, or even every few months and do a bit of financing to know where I'm at in my business, as well as prepare everything for tax time. Instead of "having" to do finances, I should be excited to look over my finances and see my income grow. Even if you have everything on hand for taxes, you might need a bit of help. We decided to do our own taxes this year, which took us about 5 hours and a couple of phone calls to my dad who is a self-employed business owner himself. Always use your life lines! You can always pay someone to do your taxes, which we did last year. We had a few businesses going and I didn't want to do all those forms for each business. I think it was worth my time to pay someone to do it last year, but I'm glad we took the time to do it this year as it helped us understand the process a bit more. It's actually kind of fun if you don't stress it, and make it a puzzle to solve. Once you know the forms you need, the instructions direct you through it all. It can be a bit of a maze, going from this form, to that, filling out this worksheet, and that worksheet. If it makes your head swim, pair up with someone and work it out, or if the game isn't fun anymore, hand it over to a professional. My dad also gave me a tip on the Making Work Pay Tax Credit. We filed a schedule M and earned a bit of tax money from that (thanks dad). I don't know anything about taxes for small businesses. Where do I start? For information on being self employed and paying taxes, you can visit the IRS information page. And this is a great thread from the etsy forums about taxes, written by Jason of JJMFinance. Also, you can always speak to someone local to you who is self employed. It depends. Check with your local city or county business bureau. My first business license was $20 for a year when I lived in Idaho. Having a business license had it's advantages. I was able to buy wholesale from certain companies that required me to have a business license and I got a cool certificate for my memory book. I spoke with the city about the need for one and they suggested that if I was going to have a lot of traffic to my residential home (clients or UPS deliveries) then it would be best to apply for a business license. That way, if neighbors complained, they'd need to complain to the city. If you're just on a hobby level you might not even need to worry about it. I'm not sure about the rest of the world but I do know that if I sell something here in Utah to another Utahn, I have to pay a state sales tax. If I sell online to someone in another state, then no, I don't need to pay a sales tax. When I do craft shows, sales tax is due to the state 10 days after the event, and sales taxes from other (non-event) sales are due quarterly. If you have questions about sales tax, you can always visit your local sales tax office. For those in other countries, please leave a comment if you know of any info or great links to share for those in your area of the world. 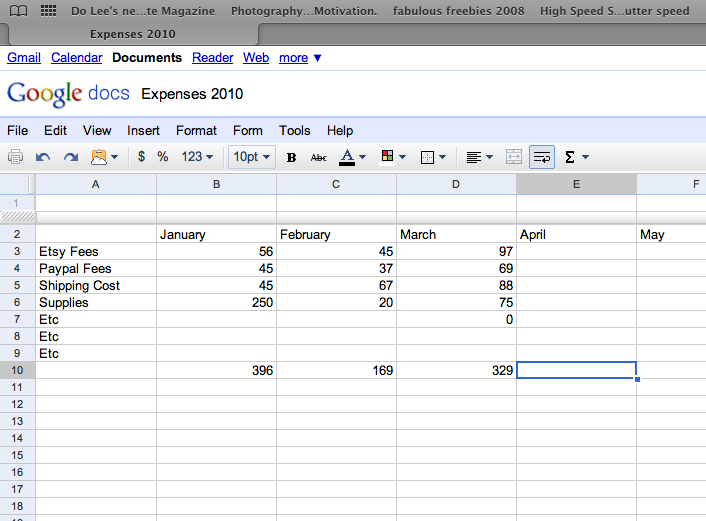 For now, my spreadsheets are set up in Google docs. It's nice for accessing from any computer with an internet connection, anywhere I may be. 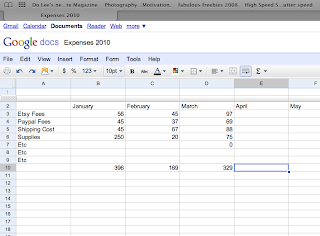 This is a screen shot (just an example) of an expenses worksheet. If you want, you can refer to a Schedule C and break down your expenses the way it does to get more detailed, instead of just listing "supplies." It's also great to break down where your costs are going to, so you can narrow down where your biggest expenditures are and find ways of being more efficient with costs. "Did I really spend $1200 on paper in December?!" I have a spreadsheet for my Expenses, one for my Gross Income, and another for my Net Income. This helps me keep things separate and organized. For hobby level or side income level this might be all that you need in order to determine your expenses, profit, and how well your business is going. Rr for the hobbyist, to know just how much that hobby costs, and whether or not it is paying for itself. Making these spreadsheets will be of great help when doing taxes. If you want something more robust (and free) I suggest using Outright.com. You can even download your Etsy transactions as a CSV file, allowing you to do your bookkeeping and tax preparation, and you can even sort your data into graphs and visuals (hooray!) When tax time rolls around, regular use of outright.com should enable you to manage taxes with less fuss. I just found outright.com, and need to evaluate it further to see if I'll want to be using it for my own business. In the meantime, does anyone with experience using it have any input? That is all so SUPER helpful, Karleigh! Thanks for the time and effort you're putting in to this serious. Obviously this doesn't all apply directly to me, being a UK seller, but the general principles are the same, wherever we are. Much useful stuff here for me! Thank you so much for the time and effort you have put into these posts - I appreciate them and I'm sure many other (more silent) readers do as well.